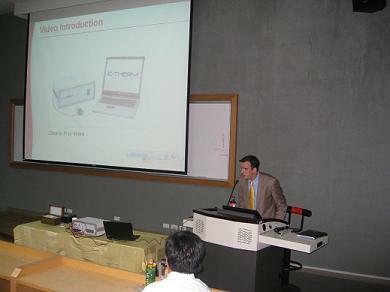 October, 2009 – It was packed lecture hall for C-Therm’s workshop on thermal conductivity hosted by the National Taipei University of Technology in Taiwan this past week. 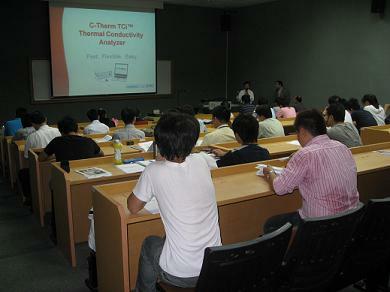 The event was coordinated by C-Therm’s Taiwanese distributor AST Instruments Corporation and saw over 50 people take part in the session that provided participants with both a practical and theoretical component on thermal conductivity measurement. 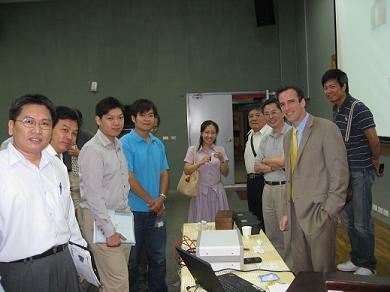 Those attendees pre-registered for the event were encouraged to bring their own samples to the session for characterization. A wide variety of liquids, powders, pastes and solids were tested with the TCi Thermal Conductivity Analyze – highlighting the instrument’s flexibility and ease-of-use. Samples tested included silicon carbide, titanium dioxide, wax, various epoxy resins with suspended carbon nanotubes (CNTs), and a wide variety of polymers and ceramics.